Arne Jacobsen (1902-1971) was trained as a bricklayer and graduated from The Technical Society’s school in 1924 and Copenhagen Art Academy 1927. In 1928 he received the Academy’s gold medal, but prior to this, when only 23, he was awarded a silver medal at the 1925 Paris World Exhibition – the first of numerous honors that became a natural accompaniment to his artistic activities, his untiring search, and his brilliant conceptions, made manifest by many successes in competitions at home and abroad. His main works include: town halls in Århus, Søllerød, Rødovre and Glostrup, SAS-building (Royal Hotel) in Copenhagen, Munkegårds School in Gentofte, Toms Chocolate Factory in Ballerup, The Danish National Bank headquarters, a sports hall in Landskrona, St. Catherine’s College, Oxford and Hamburgerische Elektrizitätswerke’s administration building. In 1932, Arne Jacobsen began collaboration with Fritz Hansens Eft. A/S, and over a period of years designed a series of chairs which are now recognized as milestones in the development of modern furniture. They include “The Ant” (1951), “The Egg” (1957), and “The Swann”(1957). But he was also an innovator in other design fields, such as the tableware series “Cylinda-line” in stainless steel. 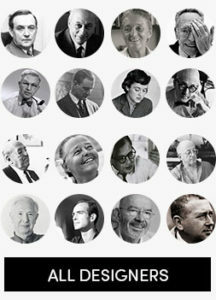 Arne Jacobsen was a professor at the Art Academy and received honorary doctorates from a number of foreign universities and academies. Cylinda-line was awarded the ID-prize 1967 by The Danish Society of Industrial Design and The International Design Award 1968 by The American Institute of Interior Designers.